Very professional and polite office environment. Front desk and nurses/PA were quick, thorough and extremely welcoming.Dr. DeMelo runs on time and explains situation, causes and treatments in an easily understandable manner. Very professional and polite office environment. Front desk and nurses/PA were quick, thorough and extremely welcoming. Dr. DeMelo runs on time and explains situation, causes andtreatments in an easily understandable manner. Had a great visit with Dr. DeMelo. The entire staff was incredibly warm and friendly and made me feel really comfortable. Dr. Rui DeMelo was raised in Westchester County, New York. He graduated from Manhattan College in the Bronx, New York with a Bachelor of Science Degree in Nuclear Medicine Technology. Afterwards, he attended New York College of Podiatric Medicine where he graduated top of his class with a Degree in Doctor Podiatric Medicine. Dr. DeMelo did his foot and ankle surgical residency at Saint Vincent's Catholic Medical Centers in New York. Currently he's a staff member at Stamford Hospital in Connecticut and Hillside Surgical Center in New York. He achieved board certification with the American Board of Podiatric Surgery in 2009. 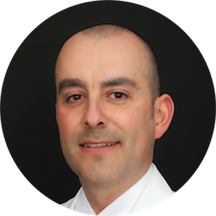 Dr. DeMelo speaks fluent Portuguese and Spanish and is a member of various societies including the American Podiatric Medical Association, Connecticut Podiatric Medical Association, American Diabetes Association and is a Fellow of the American College of Foot and Ankle Surgeons. *Any patients with Medicaid must be residents of Connecticut in order to receive benefits. Please book your appointment accordingly. Thank you! I wish all of my doctors were this fantastic. Exemplary on every level. Overall wonderful experience. Dr. DeMelo listened to my concerns and was able to suggest things to do to assist with my recovery from an ankle injury. Also giving helpful information on how to deal with plantar fasciitis. I'm beyond happy thatI chose to visit this practice for the first time. Even the support staff is helpful & welcoming. I'd recommend Dr. DeMelo to anyone. Dr. DeMelo was very knowledgeable with great bedside manner. He pulled out a skeleton model and showed me exactly what was going on with my foot. My appointment was quick and efficient given that I had to head into work right after. No wait, friendly staff, awesome doc! Short wait time, was seen immediately. Dr.DeMelo was to the point about my diagnosis and extremely knowledgeable! Would recommend. I really travel a long way hrs. to see Dr. De Melo and I find he is always great at explaining things and I sometime panic when it comes to healing because of past experiences with fractures and it always isa long process to properly heal and as a patient you have to do your part to see to your own healing by not over doing it etc.And then you have to make sure to have the best medical care you can get.The professionalism and knowledge I find with Dr.De Melo is one that I truly can say is why adore this doctor.He has helped me greatly in understanding the process and time with healing my broken toe.Some people think a broken toe is a minor issue but it isn't and it takes the proper care to heal a toe which only a good doctor with real knowledge can help you with.It can take months for healing. My fracture was not a straight fracture which everyones fracture, different toes and many many factors play a large role in figuring out treatment.Again its so important to have a doctor that the level of communication and care are 5 star and this doctor is all that truly.I dont think I could have gone through this with out a great doctor and staff.I highly recommend him.Also I havnt met one patient in his office I didnt like truly .A great karmic office environment. This was a no-nonsense visit that I was able to book same-day. Dr. DeMelo was incredibly informative and helpful. The entire staff was very friendly as well. Professional explained everything and took time before I got there to speak with me via phone so I understood when I got there the type of doctor made me feel that I was moving in a right direction for my treatment.Ialso was fortunate to have met his lovely family and inlaws.In fact I may just invite them all for a dinner.Very productive appointment and I also found the staff to be most professional and welcoming.I highly would rate Dr. DeMelo. It was my first time visiting Dr. DeMelo, and he was great. I had been having tons of anxiety about my metatarsal and heel pain, but he made me feel better about my condition and very clearly explained why the painwas happening. He ended up customizing my removable orthotics right there on the spot and gave me a lot of great advice. He is very easy to talk to, nonjudgmental, and it seems like he really cares about his patients. Thanks! Great experience will highly recommend Dr DeMelo! Dr. DeMelo was very nice and professional. Made me feel comfortable and he was very easy to talk to and allowed me to ask as many questions needed regarding my nail situation. He was wonderful! Dr. DeMelo took time with me to explain all my options, including cost implications. Dr.Rui DelMelb is a kind Dr . He listened to my problem and concern and explained what can be done to help me. Very nice staff, Dr. DeMelo explained everything about my foot pain. The staff was very friendly and Dr DeMelo was so helpful, understanding and caring! Would definitely recommend. Was very thorough and knowledgeable, answered every question and then some! Great doctor. He was kind and informative. He helped me understand how to deal with the issue and managed to get rid of the issue in less than 3 visits compared to other doctors that couldn't deal with it even after 15 visits. He is great! Great doctor and great office!! Dr. DeMelo answered all my questions and explained everything thoroughly. There was hardly any waiting time at any point in the visit, and I was in and out of there quickly. I highly recommend him! Dr. DeMelo was extremely helpful and professional. His staff was friendly and highly accommodating. I would highly recommend to anyone looking for a podiatrist in Stamford. I was in and out quickly. Friendly staff and Dr. Will surely go back if I have any other problems! Let me just say I was dreading this appointment all day. I had a pretty bad ingrown toenail that was in need of help and I am very squeamish and have a low pain tolerance. Dr. DeMelo was awesome. He talkedme through what he was doing and also kept any worries I had about pain to a minimum. Dr. DeMelo was prompt, professional, knowledgeable, highly efficient and most of all just easy to talk to. His staff was on top of their game too. I was in and out in 20 minutes. It was one of the best experiences I've had in a doctor's office. So nice with my daughter and her wart! Dr. DeMelo was fantastic. He took the time to discuss my issues and questions with me. He took care to ensure I was comfortable and treated me well. I was seen immediately when I arrived and was in and out within30 minutes. Such a great experience. He is highly competent. The staff is great. Scheduling is a breeze. Fantastic group of people and doctor. Highly recommend. Excellent experience. Friendly and knowledgeable doctor/staff. Given my issue, I was very satisfied with my experience. Dr. DeMelo was one of the best doctors I've ever seen. He talked me through everything and gave me all my options in a way that I could understand (as I am not a medical professional). I was treated like aperson and not a number on a chart. I went to this appointment on my lunch hour and was worried I would run over. When I arrived, I was taken back to an exam room and within 50 min, I had an exam, x-rays done, scans taken and follow-up instructions given. Never did I feel rushed or that any quality was sacrificed. Stamford Podiatry runs like a well oiled machine-everyone was friendly/happy to be there and was skilled at their job. I cannot recommend Dr. DeMelo and the staff of this office enough. Very friendly staff! Dr. DeMelo not only addressed all of my concerns, but also got me out the door far more quickly than I had expected. My first appt with Dr DeMelo couldn't have gone better! He put me at ease, was extremely friendly and professional, and sorted out my problem straightaway. His assistants were helpful and warm, and the clerical staff were great sorting out insurancestuff quickly. I couldn't be happier about having chosen their office! Great guy, makes you feel comfortable. Like everything it was worth the mula (since no other financial term is english was allowed) even though it was a lot. I was impressed with their new office. They fit me into their schedule the same day I contacted them (via Zocdoc) and Dr DeMelo took care of my foot problem in a professional and caring way. This was my first podiatrist appointment I've gone to and Dr. DeMelo was amazing! He answered all my questions and made me feel very relaxed. It was a great experience and would totally recommend him to friends and family! Dr. DeMelo not only solved the issue I was having but recommended ways to alleviate it going forward. Dr. DeMelo was amazing! Extremely efficient and well-managed process. Check-in was seamless and I was called in exactly at my appointment time. Dr. DeMelo was very helpful but also is just a genuine good guy that is easy to talk to. Highly recommended! He answered all my questions clearly and explained treatment options in detail. I felt good about the outcome of the examination and Dr. DeMelo's prefessionalism. Great bed side manner, Dr. DeMelo explained what issues I was having and why I was having them, he also broke down what our course of action was going to be in order to fix it. Very professional and he knows his stuff. I went to a Dermatologist thinking I had an athlete's foot and he just simply gave me fungal cream that never worked. Dr. DeMelo did a thorough investigation, took a sample for lab testand also tell me the real reason for my problem. Money well spent! Dr.DeMelo was very attentive to my foot issues and provided me with orthotics and a plan of action for the future. This was a follow up appointment & I was just has as happy the second time as the first!